No one ever said being an entrepreneur was easy. Building the plane became a little less challenging for entrepreneurs at the University of Florida when the Gator Hatchery opened in 2015 at the Warrington College of Business. 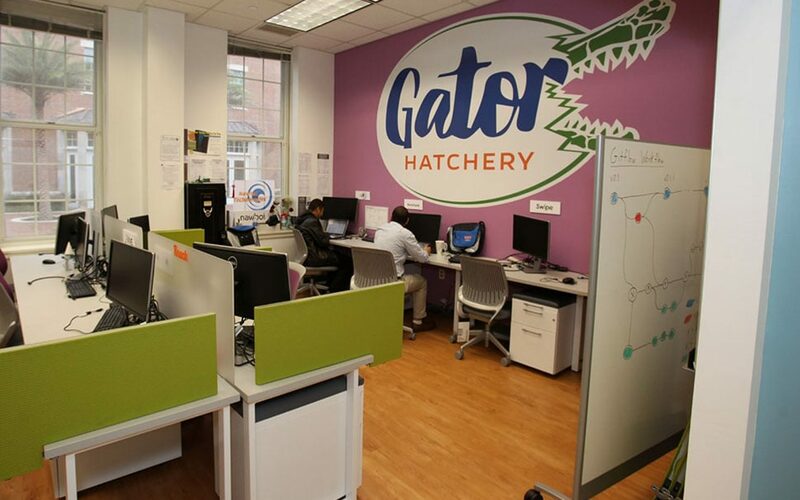 The Gator Hatchery is a student incubator that offers student entrepreneurs workspace, office support, mentors and other resources necessary for a startup to succeed. Basically, the Hatchery provides students with access to everything they need to know to launch and run a venture, explained Nola Miyasaki, Executive Director of Outreach & Incubation in the Entrepreneurship and Innovation Center. “We want to make the process [of starting a venture] as real as possible, but help students skip the mistakes and avoid the pitfalls of a venture,” Miyasaki said. In addition to giving students the space, support and other resources, Miyasaki and the faculty and staff at the Hatchery teach students about entrepreneurial competencies in real-world settings. Since opening in January 2015, the Gator Hatchery has supported 53 businesses and 104 students from colleges and schools across UF’s campus, including recent Cox Get Started Gainesville Pitch Competition winner Cocovana, founded by Sheldon Barrett (BS Industrial and Systems Engineering ‘17), who won $10,000 for his venture. The Gator Hatchery works with students at various stages in their ventures. There are three main stages: Stage 1, where students are developing the business idea and doing market research and determining feasibility; Stage 2, in which students are producing prototypes and finalizing their business plans; and Stage 3, where students are either raising capital or selling products and services. Resources for some advanced businesses in the Gator Hatchery’s third stage include funding from investors. The groups who have “graduated” from the Hatchery have raised over $1.75 million from investors and over $100,000 from angel investors, Miyasaki said. Even with their success in capital-raising, students still get real-world advice from the Gator Hatchery. In addition to what students learn in the Gator Hatchery, Miyasaki said a lot of the most successful ventures are with students studying different subjects across campus. Colleges represented in the Gator Hatchery include the Warrington College of Business, the College of Journalism and Communications, the Herbert Wertheim College of Engineering, and the College of Liberal Arts and Sciences, including students studying everything from astronomy to psychology. One venture that has seen success with students who came from multiple colleges is Knack, an app for college students to book and host tutoring sessions. Members of the Knack team from left: David Stoker, CTO; Shawn Doyle, CMO; Samyr Qureshi, CEO; Austin Doyle, Community; and Dennis Hansen, CPO. 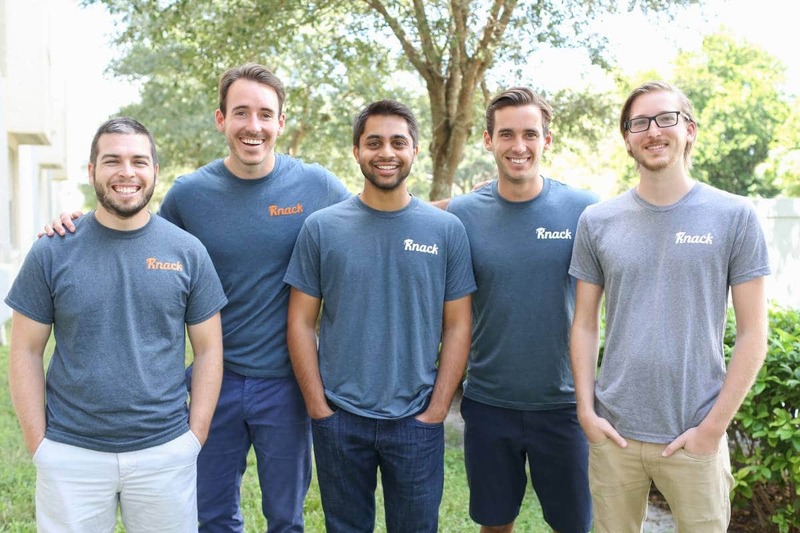 Knack CEO Samyr Qureshi (BA Criminology and Law ’14) learned about the Hatchery after he had already graduated from UF through his friend, now Knack CPO, Dennis Hansen (BS Industrial and Systems Engineering ‘16), who was still a UF student at the time. While in the Hatchery, Qureshi and Hansen, along with CMO Shawn Doyle and CTO David Stoker (BS Electrical Engineering ’11, MS Electrical and Computer Engineering ‘13), took full advantage of its resources, including business workshops, mentoring, and networking opportunities. Since graduating from the Hatchery, Knack has seen continued success. It currently serves students at almost 80 universities across the nation and has a 98% satisfaction rating among users. Knack’s number one goal for the future is to continue to drive value to students through peer-to-peer interactions, Qureshi said. While Knack is just getting started helping students discover their academic success, the Hatchery has given its founders, along with dozens of other students who have started a venture through the Hatchery, all the tools they need to run a successful venture. “They can do it, and we expect them to, because we believe in them,” Miyasaki said.